﻿﻿﻿Tommy Franks was born in Wynnewood, Oklahoma, and grew up in Midland, Texas, where he graduated from Robert E. Lee High School one year ahead of First Lady Laura Bush. After two years at the University of Texas, he joined the United States Army, and in 1967, as a distinguished graduate of the Artillery Officer Candidate School, he was commissioned a Second Lieutenant and sent to Vietnam. His service in Vietnam earned him six awards for Valor and three Purple Hearts. That assignment was the start of a long and distinguished career that would take him from one world hot spot to another – from West Germany at the height of the Cold War to the Demilitarized Zone in Korea, to the deserts of Arabia—where he gained the knowledge and experience that would prepare him for the leadership role that would mark his place in the annals of American history. Along the way, General Franks attended the University of Texas, Arlington, where he graduated with a Bachelor’s Degree in Business Administration, and Shippensburg University where he graduated with a Master’s Degree in Public Administration. He is also a graduate of the Armed Forces Staff College and the Army War College. In June 2000, he was promoted to four-star General and assigned as Commander-in-Chief, United States Central Command. It’s in this position that the world knows Tommy Franks best – the culmination of an almost four-decade military career that saw him lead American and Coalition troops in two strategically unprecedented campaigns in two years – Operation Enduring Freedom in Afghanistan and Operation Iraqi Freedom in Iraq. The General’s awards include five Distinguished Service Medals, four Legions of Merit, four Bronze Stars and three Purple Hearts in addition to numerous foreign awards. He was appointed Knight Commander of the Order of the British Empire (KBE) by order of Her Majesty Queen Elizabeth II on May 25, 2004. And President George W. Bush awarded him the Nation’s highest civilian award, the Presidential Medal of Freedom, on December 14, 2004. General Franks has received honorary degrees from a number of universities including his alma mater, Shippensburg University, and his wife’s alma mater, Oklahoma State University. Since his retirement from the military in 2003, General Franks has traveled the world, speaking on leadership, character and the value of Democracy. His autobiography, American Soldier debuted as No. 1 on the New York Times Best Sellers list in August 2004. 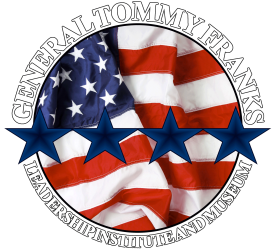 General Franks serves on the boards of the University of Texas, Arlington and William Penn University. He is Co-Chair of the Flight 93 memorial foundation and serves as an Advisor to the Military Child Education Coalition, Operation Homefront Oklahoma and the Southeastern Guide Dog Organization. General Franks and his wife, Cathryn Carley Franks, have one daughter, who is married to a military officer, and three grandchildren. The Franks live at their ranch in Roosevelt, Oklahoma, with longhorns, buffalo, Angus cattle, horses and their cat, Bailey. In this riveting memoir, General Franks retraces his journey from small-town boyhood in Oklahoma and Midland, Texas, through a lifetime of military service. Drawing on his own recollections and military records declassified for this book, Franks offers the first true insider’s account of the war on terrorism that has changed the world since September 11, 2001. American Soldier is filled with revelation. He offers an unvarnished portrait of the “disruptive and divisive” defense bureaucracy, and a candid assessment of the war’s aftermath. Few individuals have the chance to contribute so much of themselves to the American story as General Tommy Franks. In American Soldier, he captures it all. More. General Franks enlisted in the Army in 1965 and attended basic training at Fort Leonard Wood, Missouri. After completing basic he received training as a cryptographic analyst at Fort Devens, Massachusetts. PFC Franks was later selected to attend The U.S. Army Artillery and Missile Officer Candidate School (USAAMOCS), Fort Sill, Oklahoma and was commissioned a second lieutenant in 1967. After an initial tour as a battery Assistant Executive Officer at Fort Sill, he was assigned to the US 9th Infantry Division, Republic of Vietnam, where he served as Forward Observer, Aerial Observer, and Assistant S-3 with 2nd Battalion, 4th Field Artillery. He also served as Fire Support Officer with 5th Battalion (mechanized), 60th Infantry during this tour. In 1968, Franks returned to Fort Sill, where he commanded a cannon battery in the Artillery Training Center. In 1969, he was selected to participate in the Army's "Boot Strap Degree Completion Program," and subsequently attended the University of Texas at Arlington, where he graduated with a degree in Business Administration in 1971. Following attendance at the Artillery Advance Course, he was assigned to the Second Armored Cavalry Regiment in West Germany in 1973 where he commanded 1st Squadron Howitzer Battery, and served as Squadron S-3. He also commanded the 84th Armored Engineer Company, and served as Regimental Assistant S-3 during this tour. Franks, after graduation from Armed Forces Staff College, was posted to The Pentagon in 1976 where he served as an Army Inspector General in the Investigations Division. In 1977 he was assigned to the Office of the Chief of Staff, Army where he served on the Congressional Activities Team, and subsequently as an Executive Assistant. In 1981, Franks returned to West Germany where he commanded 2nd Battalion, 78th Field Artillery for three years. He returned to the United States in 1984 to attend the Army War College at Carlisle, Pennsylvania, where he also completed graduate studies and received a Master of Science Degree in Public Administration at Shippensburg University of Pennsylvania. He was next assigned to Fort Hood, Texas, as III Corps US Deputy Assistant G3, a position he held until 1987 when he assumed command of Division Artillery. He also served at 1st Cavalry Division during this tour. His initial general officer assignment was Assistant Division Commander (Maneuver), 1st Cavalry Division during Operation Desert Shield and Operation Desert Storm. During 1991-92, he was assigned as Assistant Commandant of the Field Artillery School at Fort Sill. In 1992, he was assigned to Fort Monroe, Virginia, as the first Director, Louisiana Maneuvers Task Force, Office of Chief of Staff of the Army, a position held until 1994 when he was reassigned to South Korea as the CJG3 of Combined Forces Command and U.S. Forces Korea. From 1995-97, General Franks commanded the US 2nd Infantry Division, Korea. He assumed command of US 3rd Army/Army Forces Central Command in Atlanta, Georgia, in May 1997, a post he held until June 2000 when he was selected for promotion to general and assignment as Commander in Chief, United States Central Command. General Franks' awards include the Defense Distinguished Service Medal; Distinguished Service Medal (two awards); Legion of Merit (four awards); Bronze Star with Valor device and two oak leaf clusters; Purple Heart (two oak leaf clusters); Air Medal with Valor device; Army Commendation Medal with Valor device; and a number of U.S. and Foreign Service awards. He wears the Army Staff Identification Badge and the Aircraft Crewmember's Badge. He is a Knight Commander of the Order of the British Empire. In 2004, President George W. Bush awarded him the Presidential Medal of Freedom. General Franks retired on July 7, 2003 after a change of command ceremony in Tampa, Florida.